We are coming to the end of our two week summer holiday at the caravan. It is the longest stretch we get all year so I'm a bit sad. But it has been really enjoyable. Most of the days have been gloriously sunny and we have been out and about so we are nicely tanned. We did have two days of non-stop rain in the middle but that was just to remind us that we are still indeed in the UK! But we were ok because we have *cagoules and scrabble! As usual we have eaten too much, drank too much and spent too much money :) But then that is what holidays are for. We have walked miles and miles in wonderful scenery and every morning we have been swimming. We've read, shopped and done no cooking what-so-ever instead we have eaten picnic or pub lunches or chips with scraps and lots of salt and vinegar, followed by ice cream cones. Why can't this be my life all the time? Wouldn't it be fab! Oh well back to reality (and the diet!) on Monday! At least I still have 3 weeks off work even if I do have a ridiculously long 'to do' list to crack on with. And I better add some crafting to it seeing as I've bought lots of paper crafting materials and fabric etc. * OMG cagoules bring back so many cringey memories from my childhood. My parents, my brother and I all had matching red ones duringthe 70s. I must have been around 8 or 9. How bloody embarrassing. I remember wearing them at Butlins in Filey and other family days out. How could my parents do this to us. Traumatic! These are some pictures i took over a week ago, during a trip to Flamborough. Go visit & drool over the fantastic offerings - still time to enter! I wouldn't say my ironing pile was big or I've been neglecting it this week in favour of card making but I stood ironing for three hours this afternoon. AND I'm only half way through it! aaaarrrrrrr! Ok - time for some Saturday evening family TV, some takeaway food and maybe a glass of wine. I have been at the caravan and had a lovely weekend but am I happy? NO I am not. I have horrible PMT and am a right pain in the youknowwhat! I just pray for early menopause and be done with it all. 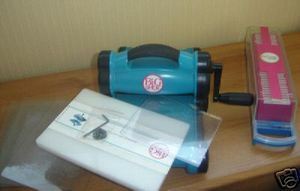 It is a Sizzix Big Shot - I have wanted for ages and it comes with a set of alphabet dies. I have been back making cards recently so i decided to splurge. 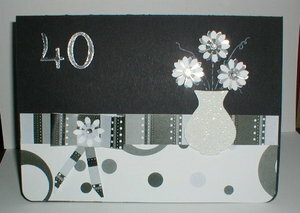 I already have a standard sizzix machine but it won't cut all the new dies that I want to use. I can't wait for the new machine to arrive so I can play with it. 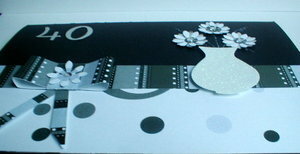 Sometimes I think I like buying card making supplies and equipment more than i like making them. I also ordered some rubberstamps, ez mount and watercolour pencils - somebody stop me! So much for my resolution to blog more! Is it me or are a lot of bloggers off doing other things in January? It seems quieter than normal around here but then again I haven't been around much myself. I have so much reading and catching up to do! I have been focusing on my diet and fitness (see I have been keeping up with my other resolutions!) I have been absorbed in following my Sparkpeople food plan and have been walking and working out resulting in 13 pounds off so far. I am really pleased and feeling so much better for it. 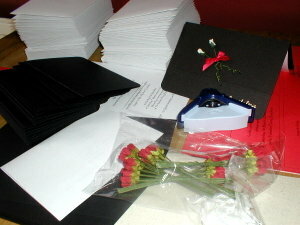 I am also in the middle of a big run of wedding invitations for a friends wedding (see pic above) so most of today will be spent working on those. In fact most of the week will. At least it will take my mind off food. Hello!! I am glad to say I am back in the land of the blogging! 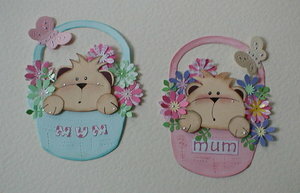 Here in the UK it is Mothering Sunday. 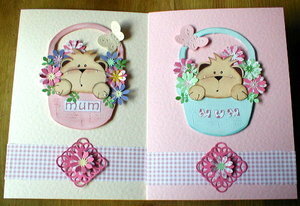 I decided to dust off my cardmaking kit and make my own Mother's Day cards for my mum and mum-in-law. 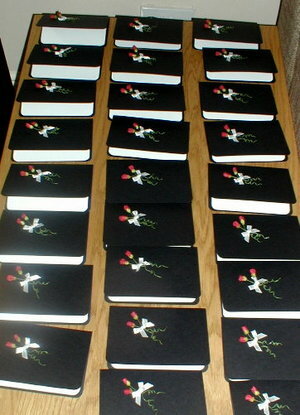 It was good to make some cards again, after nearly two years! I used to produce dozens every week but since I started working full time and packed all my supplies away I just haven't got round to starting again. Well now I have the bug again and today I plan on making more cards (to use myself and sell at work) and also I think I'll make some toppers to sell on ebay/etsy. I wish I had more time to craft. I think the real problem though is that I don't have a craft room. I just don't have any space for one right now so I have to make the best of my kitchen table which is usually full of some sewing project or paper scraps. It is a problem because I am a bit of a tidy freak and crafting is sooooo messy. Oh well, I will just have to manage! I wonder how Samantha went on at the Country Living Spring Fair?